This post may contain affiliate links to help our readers find and buy the best products! Read our full disclosure for more info. You might have noticed that I haven’t been around as much this past week, well I assure you there is a good reason. Last week I headed out for a weekend full of fun, excitement, adventure all with an amazing group of women. After attending Brandcation: Bloggers Gone Coastal I knew that somehow, some way I would do my best to attend any future Brandcation events. They are not only so much fun, but being able to learn about different companies and attractions across the US is a once in a lifetime event. I wanted to give a special SHOUT OUT to all the amazing sponsors who helped make this adventure possible. Without the generosity of these amazing companies we wouldn’t have been able to experience some of the events that we did and I wouldn’t be able to share with you ome of the highlights and favorite parts of these blogger event. Without the generosity of these great companies Brandcation would not be possible! I’ll be highlighting some of these events and products over the next few weeks so be sure to stay tuned to learn all the hottest spots to visit in Pigeon Forge. 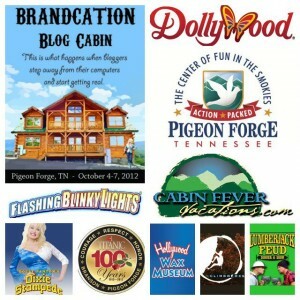 *Thanks so much to the amazing sponsors who covered events, food and lodging during Brandcation. Great list of sponsors! I followed the hashtag and am so envious of everyone who went! So awesome of the sponsors! You all had a packed schedule. Sounds like a ton of fun! I so want to go to the next Brandcation event. Sounds like everyone who went had such a great time! Aw, I am so jealous! I know that you gals had an amazing time! Sounds like a fabulous time! This looks like a fun time, would of loved to go and have such a fun time with bloggers and sponsers! what great sponsors! I’ve always wanted to go to a blog conference / workshop – this one sounds like fun! Wow! That’s a great list of sponsors. I hope to make it to a conference someday. I’ve heard good things about this conference. I’d love to attend one of these. What a great list of sponsors! WOW you guys got to get some great experiences and cool stuff.